Product prices and availability are accurate as of 2019-03-18 18:41:07 EDT and are subject to change. Any price and availability information displayed on http://www.amazon.com/ at the time of purchase will apply to the purchase of this product. 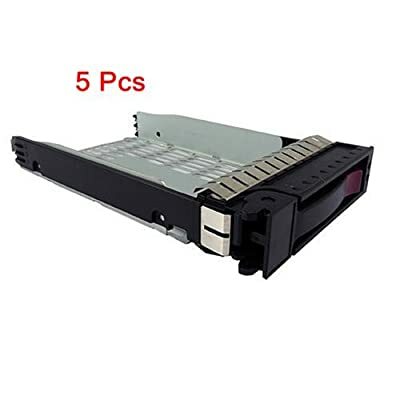 (5 Pack)3.5" SATA SAS Hard Drive Tray Caddy for HP Compaq ProLiant DL160 G5 G5p G6 DL165 G5 DL180 G5 G6 373211-001 373211-002 3.5 SATA/SAS Hard Drive Tray/Caddy drive mounting screws for HP Compaq 373211-001,373211-002.Compatible HP Part Number : 373211-001,373211-002.Compatble With: HP ProLiant DL140 G2, DL140 G3, DL145 G2, DL145 G3, DL160 G5, DL160 G5p, DL160G6, DL165 G5, DL180 G5,DL180G6, DL185 G5, DL320 G3, DL320 G4, DL320 G5, DL320 G5p, DL360 G4p, DL360G5, DL380 G5, ML110 G3, ML150 G3, ML150 G5, ML150G6, ML310 G2, ML310 G3, ML310 G4, ML310 G5, ML350 G4p, ML350 G5, ML370G5? ?ML350G6, DL 180G6.This tray is also available with those drives: 349237-B21, 349238-B21, 349239- B21, 454414-001,461289-001, 454273-001, 432401-001, 389343-001, 454410-001"
3.5 SATA/SAS Hard Drive Tray/Caddy drive mounting screws for HP Compaq 373211-001,373211-002. Compatible HP Part Number : 373211-001,373211-002. Compatble With: HP ProLiant DL140 G2, DL140 G3, DL145 G2, DL145 G3, DL160 G5, DL160 G5p, DL160G6, DL165 G5, DL180 G5,DL180G6, DL185 G5, DL320 G3, DL320 G4, DL320 G5, DL320 G5p, DL360 G4p, DL360G5, DL380 G5, ML110 G3, ML150 G3, ML150 G5, ML150G6, ML310 G2, ML310 G3, ML310 G4, ML310 G5, ML350 G4p, ML350 G5, ML370G5? ?ML350G6, DL 180G6. This tray is also available with those drives: 349237-B21, 349238-B21, 349239- B21, 454414-001,461289-001, 454273-001, 432401-001, 389343-001, 454410-001"